This is a story of how Carla's quilt came to be! We are originally from the Azores (nine tiny islands off the coast of Portugal). My mother went there this year on vacation and was there over the Mother's Day weekend. I wanted to send her flowers for Mother's Day and immediately started working on finding a flower shop to send her the flowers, not realizing how remote the island she was on was. I tried and tried but to no avail. I decided to register on Facebook and post a request for help on a Sao Jorge Group (the island my mother was on). I simply posted that I needed someone to do me a favour. I immediately got a response from a lady named Carla who said she wouold gladly help. She agreed to buy the flowers and deliver them personally to my mother. As we wrote back and forth I realized that she was only two doors away from my mother and knew the family really well. She did this for me and it was a great surprise for my mother. As we talked Carla told me she had lost her and dad and shared with me how sad she was and how emotional she was with my love for my mom. I wanted Carla's address to send her the money but she refused money so I decided since I love to quilt that I would make her a quilt. I went onto her facebook page and requested to be friends with all of her friends and started to collect photos of her and her father, our hometown and a few inspirational sayings and phots and ended up with a collection of 36 images to put onto 36 squares one of which was the words "Rest in Peace" written in the sand at the beach which I took a photo of, also a photo of me and my mother. Since our island is surrounded by the ocean and you really can't go anywhere without an acean view I made the quilt all in blues that reminded me of the beautiful water around the island. So here is my quilt for Carla. I have shipped it to her, she has not yet seen it, but I am anxiously waiting for her to receive it and see if she likes it. Man is Carla ever gonna love that quilt! It's beautiful! Way to go Grace! I don't care what your name is... That's one fine quilt and one beautiful story right there. Beautiful....not sure which is more, the story or the quilt! SHe is going to MELT in appreciation!! Wow! Congrats on the completion of the quilt. It is beautiful! 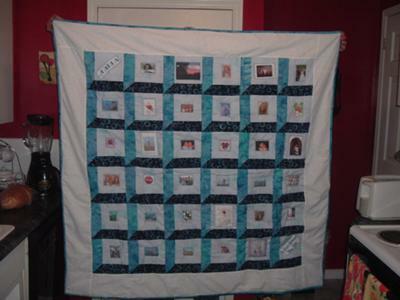 It's such a wonderful story and it was very thoughtful of you to share that through a quilt. Beautiful story, and beautiful quilt!!! This just goes to prove that what goes around, comes around...if you do something good for someone, it comes back to you! Grace is a hard working girl who loves to make things like this , I love the story Grace and hope that your new friend Carla will love it in the end , cuz who wouldn't , I have seen with my own eyes the stuff Grace is able to make , and man are they ever so beautiful when she is done with it !!! Keep up the Great Work !! Grace does always a beautiful job on quilts and other things she makes !! Beautiful job. If the recipient doesn't like it send it to me, I don't know the people but I will display it proudly. Hey you, that is an incredible job, if she doesn't like it send it over to me. I don't know the people in the phots but I will display it anyway. wow what a great idea and a beautiful quilt. gift. i'm sure she will treasure it. Beautiful story and great idea.